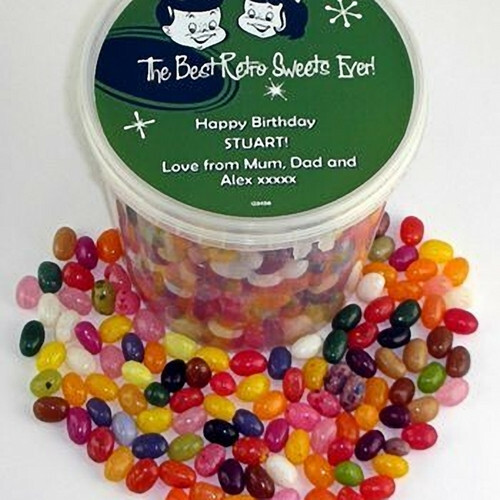 Personalised Gourmet Jelly Beans Bucket - Looking for a gift for a discerning Jelly Beans Lover? And where you can add your own special message? This is perfect. The 'bucket' is crammed with over 900g of delicious, juicy gourmet jelly beans of pretty well every flavour that you can imagine... and then some! They're proper high quality jelly beans, where each one tastes of a different flavour... from coconut to liquorice, banana to cinnamon. They even have one that tastes of peanut butter! Oh... and did I mention that there are over 20 different labels to choose from? There's one for every occasion, and every person, under the sun.